The Cloistered Heart: Surprise Surprise! Just before we begin to seriously embark on "another look," I learn that we've been honored with a lovely new year surprise! 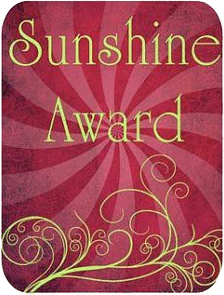 The Cloistered Heart is nominated for a Sunshine Award! Thank you, Melanie at Joy of Nine9, for a dash of fun and sun on this blustery winter's day. Number 1: check. Number 2: check. Number 3. Pieces of information about myself. (I loved reading Melanie's!). Hmmm. Think I'll just throw a potpourri of things out there, in whatever order they flitter across my mind.... wheeee! 1. God is important to me! (you're not shocked). 3. Books are important to me (now yawning, you're wondering if this blogger passed fourth grade). Not only do I love to read, I love to live surrounded by books. They are my wallpaper of choice. Two walls of my living room and two walls of my family room are literally lined with them. 5. I am a very chattery (okay, okay: too chattery) INtrovert. 6. I am older than you think. My goodness.... you think I'm THAT old?!! O my. Now add ten years. 8. When my husband and I were dating, we often stopped to make a visit to the Blessed Sacrament at our University's student center chapel (his idea) before he walked me home. This added to his love of fun and his keen intellect made me fall head over heels. And he went in the reverse direction the night he met me, when he tried to impress me by literally standing on his head. I chose not to hold that against him. He was only nineteen; he had an excuse. 9. I find action movies boring. My mind wanders during battle scenes. 10. I like cool weather, nature, mountains, the ocean, chicken with mushrooms, ticking clocks, Call the Midwife, poetry, and I hate beer. Nominated bloggers. I generally don't link to non-cloistered sites on this particular blog, but will make an exception this time. However, in keeping with the prayer focus of The Cloistered Heart, I am only naming blogs that almost always stick to posts about prayer and growing in holiness. So, here are a few that fit into the category of "spirituality blogs." Check. Check. Check. Check. Check. This has been a fun change of pace!